Building your own kayak is a labor of love. Seeing someone's hand built kayak on the water or even on the roof racks of their vehicle always causes us to stop and look. 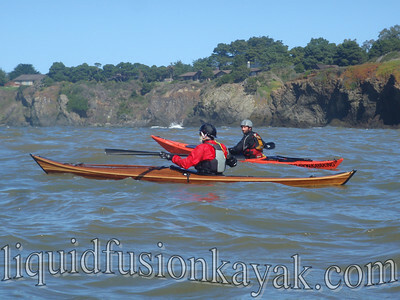 Our paddling buddy John just completed his strip built Guillemot Petrel. Needless to say it is beautiful, but now it is time to get that beauty on the water. Yesterday, we celebrated the launching of John's Petrel with Bruce and Georgianna from Humboldt County. Bruce and Georgianna have the wooden boat and paddle bug. Georgianna carves her own Greenland-Style paddles. 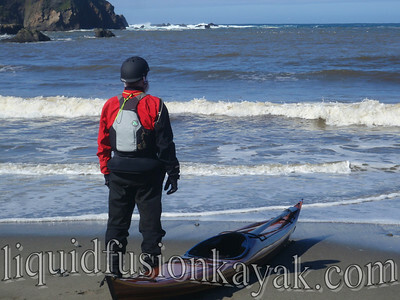 Bruce paddles a wooden kayak and wing paddle that he designed and built himself. Jeff and I paddled our plastic Valley Avocets - maybe someday we will be sporting our own craftmanship on the water. We launched from Caspar Beach and paddled through the bay past the outside reef into the ocean (the group was hoping to watch for whales). John's first strokes in the Petrel were in the surf zone. The boat glided with minimal effort through the water and out into the bay. Conditions were rough with 10-12 foot seas with 2-4 foot wind waves and whitecaps. Nevertheless, John and the Petrel looked at home on the water. 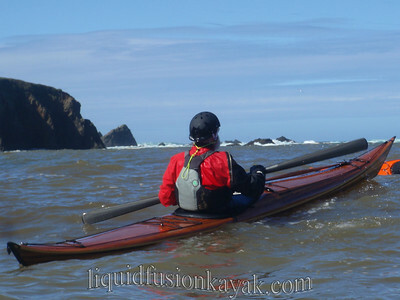 "Like its bird namesake the Petrel kayak is at home at sea where it can dance among the waves." - Nick Schade - designer of the Petrel. It was a short paddle due to my aversion to paddling on warm, sunny days (actually my pining for a mountain bike ride). However some nice surf waves at Caspar Beach prolonged the paddle as Jeff and I enjoyed gliding on some green faces in our 16 foot sea kayaks.